These cream cheese chocolate cookies are soft cookies with wonderful texture and flavor. The addition of cream cheese along with the butter gives these chocolate chip cookies a rich, dense, cake-like texture. The cookie dough is versatile, too. Instead of chocolate chips, use part peanut butter chips or white chocolate chips. Or make them raisins and a dash of spice flavor. See the tips and variations for more. The recipe makes about 2 1/2 dozen, and it can be doubled easily for 5 to 6 dozen cookies. Heat oven to 350 F (180 F C/Gas 4). Grease a cookie sheet, spray with nonstick cooking spray, or line with parchment paper or a silicone baking mat. In a mixing bowl with electric mixer, beat cream cheese, butter, and the granulated and brown sugars until light and fluffy. Beat in egg and vanilla until smooth. Slowly beat in the flour, baking powder, and salt. Fold the chocolate chips into the dough. Drop the dough by teaspoonfuls onto the prepared baking sheet(s), leaving about 1 inch between cookies. These cookies spread very little. Bake for 10 to 14 minutes, or until the cookies are set and lightly browned around the edges. Add about 1/2 cup of chopped pecans or walnuts to the cookies for the extra texture and flavor. Replace the semisweet chocolate chips with milk chocolate chips, or replace half of them with peanut butter or white chocolate chips. 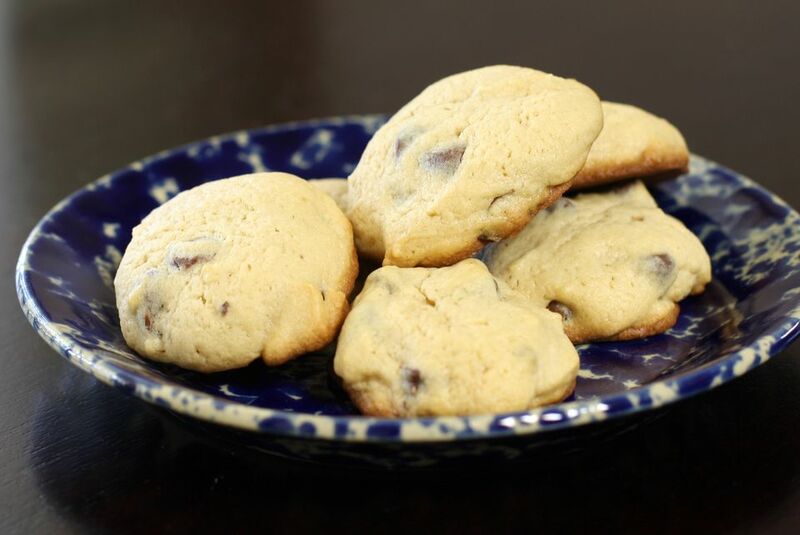 Cream Cheese Raisin Cookies - Add 1/2 teaspoon of cinnamon to the dough along with 1 cup of raisins and chopped nuts, if desired.